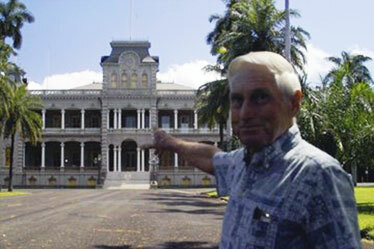 Frank Haines shows Iolani Palace, one of 23 historically significant buildings included during the AIA Architectural Walking Tours of downtown Honolulu. Eighty-six-year-old Frank Haines views buildings with the same sense of awe and wonder as an art aficionado would view a Rembrandt. Free tours: Start at 9, 9:30 and 10 a.m. April 28, with additional tours added as needed at 10-minute intervals between 9 and 10 a.m. Participants will receive AIA Honolulu's "Exploring Downtown" guidebook. Group limited to 10 people. Call: 545-4242 (ext. 12 for voice mail). Reservations required. Web site: www.aiahonolulu.org. Click on the "Architectural Walking Tours" link to RSVP online. Notes: The tour is normally held at 9 a.m. Saturdays by advance reservation. Cost is $15 per person, including the guidebook. If a group wishes to share one guidebook, the tour cost is $15 for the first person and $10 for each additional person. The tour is not open to children under 12. Wear a hat, comfortable walking shoes and sunscreen. "A well-designed building is appreciated by the people who live in it, work in it or visit it, and by the community around it," said Haines. "It can really be a work of art that exudes grace, beauty and uniqueness." Haines enjoyed a distinguished 50-year career in architecture in Hawaii, earning notice for projects such as the Prince Kuhio Federal Building and Courthouse and Kaiser Permanente's Honolulu Clinic and Moanalua Medical Center. He was president of Architects Hawaii, the state's largest architectural firm, in the 1970s and 1980s, and currently serves as chairman of its board of directors. He's also the primary guide for the Saturday morning architectural walking tour sponsored by the Honolulu chapter of the American Institute of Architects. On April 28 the walking tour will be offered free in celebration of AIA's 150th anniversary this year and Gov. Linda Lingle's proclamation designating April as AIA 150 in Hawaii Month. AIA HONOLULU was established in 1926. Among its founding members were Charles W. Dickey and Hart Wood, who collaborated on notable projects such as Honolulu Hale and the Alexander & Baldwin building, two of the stops on the walking tour, which launched in 2000. "Our principal goal was to acquaint local residents and visitors with the rich heritage all around us in downtown Honolulu," said Haines. "Our secondary incentive was to provide some financial support to AIA Honolulu. The fee charged for the tours helps us fund visiting lecturers, scholarships and other community services." During the 2 1/2-hour tour led by Honolulu architects, participants learn about the architectural style and historical significance of 23 buildings dating from 1821 to 1995, including Kawaiaha'o Church, Iolani Palace, Washington Place, the YWCA building, Hawaii Theatre, state Capitol and Aliiolani Hale. Haines led the Architects Hawaii team that researched the history and managed the restoration of Aliiolani Hale from 1976 to 1978. "Aliiolani Hale's name translates as 'house of the heavenly chiefs,' and it's probably the most often-photographed building in Honolulu," said Haines. "Hundreds of visitors take their picture in front of the King Kamehameha statue every day and, incidentally, Aliiolani Hale, which stands behind it." There in January 1893, in a second-floor room, Sanford Dole, Lorrin Thurston and other American reformists drafted the proclamation that deposed Queen Liliuokalani and brought an end to the reign of the Hawaiian monarchy. On both the national and state registers of historic places, Aliiolani Hale now houses the Hawaii State Supreme Court, the justices' offices, a law library and the Judiciary History Center, but it originally was planned as a palace for the alii (monarchy). King Kamehameha IV, Alexander Liholiho, purchased the entire block bounded by King, Punchbowl, Queen and Mililani streets for the palace, which he felt should reflect the grandeur of the royal residences he and Queen Emma had seen in Europe. "During the course of research for the Aliiolani Hale restoration project, our team found a copy of a letter written by the king's secretary that was addressed to the Hawaiian consul in Sydney, Australia," said Haines. "In it, the king stated that he wanted to build a new palace, but since there was 'no qualified architect in Hawaii,' he requested proposals from Australian architects." Aliiolani Hale's design was based on sketches by Sydney architect Thomas Rowe, which reflected Greek and Roman influences. Liholiho died in 1863, nine years before construction of the building began. Plans for it changed when his brother, Lot Kamehameha, Kamehameha V, took the throne. Recognizing that most of Hawaii's government offices were in small, cramped quarters, Lot instructed Robert Stirling, superintendent of public works, to instead prepare working drawings for an administrative center. Stirling significantly revised Rowe's sketches, allowing space for the royal legislature, Hawaii's courts and ministries, and a museum, which displayed feather work, calabashes and other treasures of the Kamehameha dynasty (these were later moved to Bishop Museum). Lot laid the cornerstone for Aliiolani Hale on Feb. 19, 1872, along with a time capsule containing the constitution of the Hawaiian kingdom, photographs of alii dating back to Kamehameha I, Hawaiian postage stamps, 21 Hawaiian and foreign coins, 11 different local newspapers and an assortment of books, including a Hawaiian language dictionary. Historians believe the capsule is buried beneath large concrete slabs in the northwest corner of Aliiolani Hale. There it will remain, as removing it would result in major damage to the structure. Interestingly, Aliiolani Hale holds the distinction of being among the very first buildings in the world built of concrete. Although Lot wanted it to be in the Renaissance Revival style, he couldn't afford the expense of importing the cut stone used in similar structures in Europe and America. Instead, concrete blocks cast on the site under the supervision of Australian masons were used to construct the building. The blocks were so well made they could easily be mistaken for stone. Lot and his successor, King Lunalilo, both died before Aliiolani Hale was completed. King Kalakaua dedicated it in 1874, the year he ascended the throne. AMAZINGLY, WHEN Haines and his team inspected the building in 1976 (it was 102 years old at the time), they didn't find a single structural crack. Haines has countless stories to share about Honolulu's historic buildings, and his enthusiasm is infectious. Not surprisingly, architects are the participants who usually get most involved with the subject matter. He recalled a recent group of architects from Calgary, Manitoba, in Canada, who asked so many questions and made so many comments, the tour took 3 1/2 hours instead of 2 1/2. "They were so interested in what the tour covered, it could've gone even longer," he said with a chuckle. "It only goes to show that although buildings don't utter words, they do speak to us."